It's a virtual princess party, y'all! I'm teaming up with some fabulous confections bloggers, Marlyn and Haniela to bring you one adorable virtual princess party! 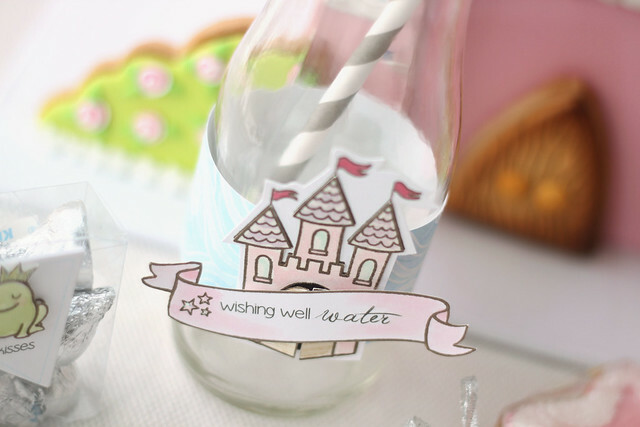 All of the elements for my party decorations were water-colored - in the quickest, easiest way possible! I wanted this to be a stress-free party! I used two lawn fawn stamp sets to create my decorations: critters ever after and bannerific. I tried my best to create a soft, and airy ensemble. 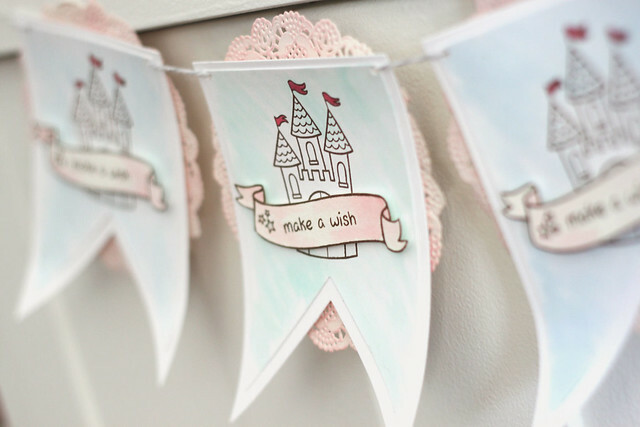 My banner pennants were given a wash of blue ink, and the "make a wish" banner was highlighted in pink. I backed each pennant with a doily that I sponged with the same pink ink. Only the castle flags were colored - easy peasy! 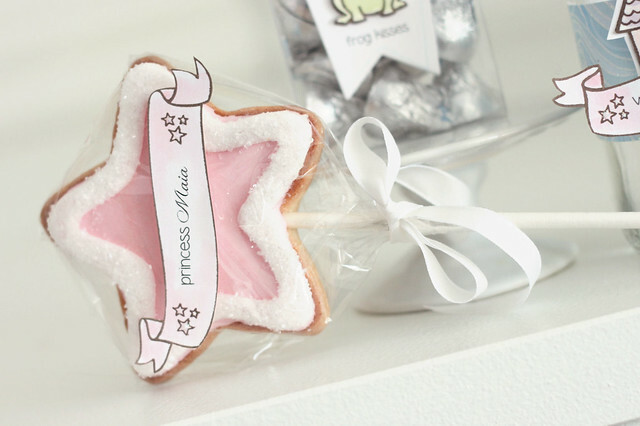 Each little party-going princess needs her own wand. Marlyn, of Montreal Confections, made these sugar cookie wands. 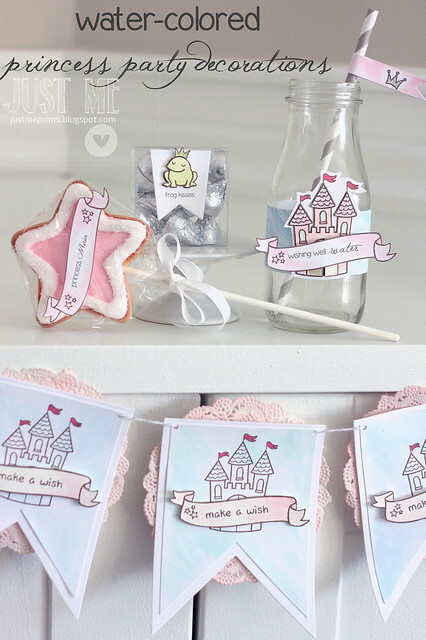 I created a personalized banner on each one - adorable at a princess party to identify each little girl's place! One of my most favorite elements was this water bottle cover. I used blue patterned paper and a castle cut-out was adhered to the front. I tried my hand at clever with the "wishing well water" sign. My mom made a funny: she said it was one step above holy water - hee. The little wannabe prince charming is leaving you kisses. I filled a clear box with hershey's kisses, and die cut a banner shape that tied back in with the main banner. 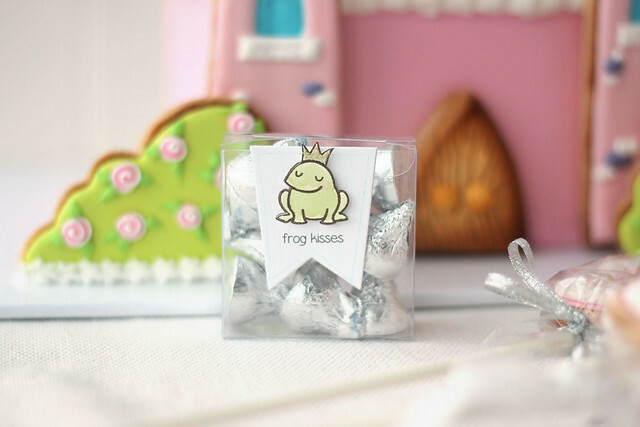 On the front, I popped up my cute frog with some foam squares. In the background of some of my pictures, you're spying Marlyn's beautiful princess cake. You have to check out her post, and Haniela's as well - they are amazing! We've all created little video tutorials for you on youtube. Click *here* for mine. It's the first time I'm showing off my hands in a video ;) I apologize for the poor video quality. I'm still trying to figure all of this out! Ooooh, this is gorgeous! I love the theme and that banner is DARLING! Oh my goodness, these are soooo sweet! Love them! 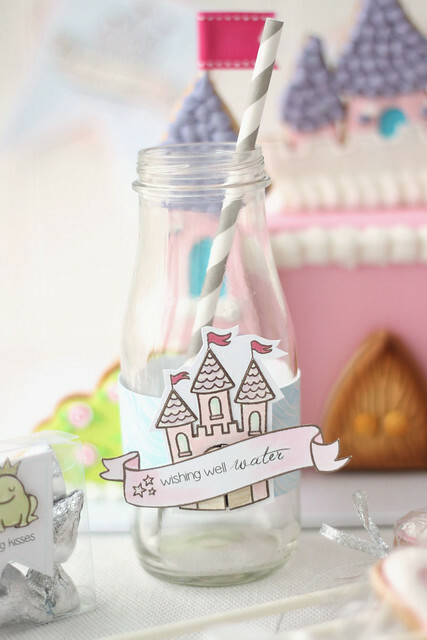 This is just the sweetest project ever...perfect for a princess party!!! Gorgeous party! You are so good at this!! I want to go to your princess party! So while it's true that the people make an event (and the people definitely made any event!) this space definitely adds a different dimension to it. Still time to enter the birthday giveaway!